The California Employment Development Department (EDD) released statewide county employment data today for the October 2014 period. At 5.8 percent, San Diego County’s unemployment rate dropped 0.1 points from September to October, and fell by 1.6 points from this time last year. The unemployment rate in the region remained 1.2 points below California’s 7.0 percent rate and tracked just above the U.S. average of 5.5 percent. While a 0.1 point decrease may not seem particularly outstanding, the unemployment rate continued its descent while the labor force added 14,900 job-seekers this month. Unemployment claims remained flat, meaning there was one job for every one person who re-entered the labor force. 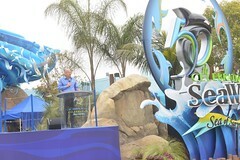 This is a great sign moving forward, since it shows that workers are encouraged and finding jobs. When looking at employment changes, we see a mix of private and public sector growth, the latter due mostly to the return of public school employees. From September to October, the region’s total employment grew by 12,500 jobs, with the private sector accounting for 5,700 jobs. Monthly private sector gains were partially offset by the continued seasonal decline of accommodation, recreation and food service workers that support our visitor and convention economy. These changes happen every year, as the summer travel season winds down. Much of this employment is made up for with seasonal gains in the retail trade sector, as businesses begin serving back-to-school and holiday shoppers. 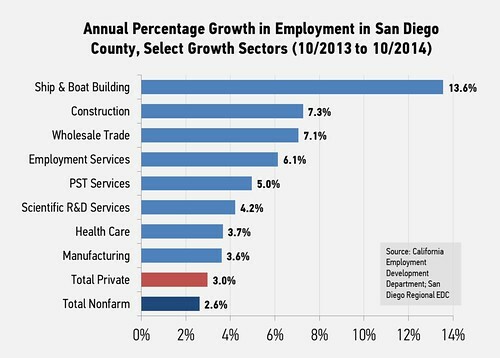 Perhaps more importantly, San Diego’s total and private employment growth continued to outpace the U.S. average. 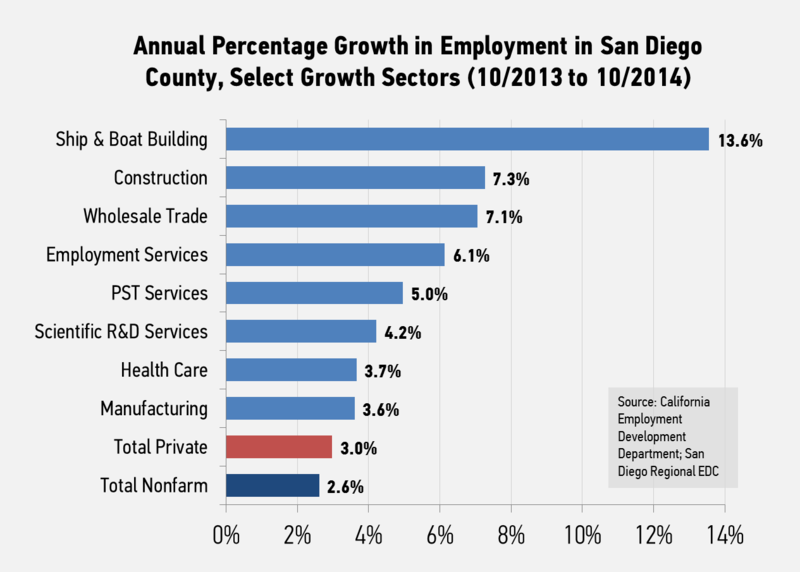 Since October 2013, San Diego’s employment grew by 2.6 percent compared to 2.0 percent nationally. Likewise, the region’s private sector grew by 3.0 percent compared to 2.3 percent nationally. Most of the private growth from September to October came from a handful of industries. Health care, education, retail trade and administrative services alone added more jobs than the net private sector, meaning the 7,300 jobs added in those industries were offset by losses elsewhere in the private sector, mostly in tourism-related industries. San Diego’s construction and manufacturing industries had a slow month, but that is typical for this period. These industries are still producing high year-over-year employment gains. Construction and manufacturing added a combined 8,000 jobs since October 2013, and both are growing well above the private sector average. Innovation sectors continued to show annual job growth. Ship and boat building grew by more than 11 percent and is a critical component of our maritime cluster. The professional, scientific and technical services sector grew by 5.0 percent and represents many of our innovation employers. 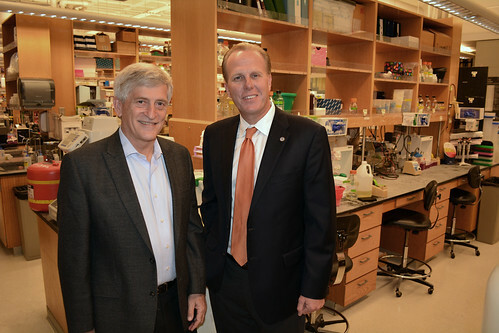 More specifically, scientific research and development services, which represents many cleantech and life science companies, grew by 4.2 percent since last October. The numbers from October’s report are promising. We don’t entirely know the deeper causes behind the labor force and unemployment numbers, so optimism should be tempered in that regard. 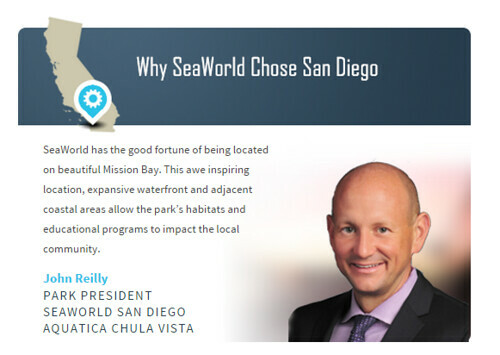 However, San Diego continues to experience above average annual job growth driven by its core industries like health care, advanced manufacturing and science-related services, which is clearly something to remain optimistic about. Earlier this month, EDC released its Manpower Monthly Employment Report. Since then, the U.S. Bureau of Labor Statistics has released September employment data on all U.S. metros, which allows us to analyze some key indicators across geographies. Click on images to enlarge in a new window/tab. At 5.9 percent, San Diego’s unemployment rate ranked 16th among the 25 most populous U.S. metros. 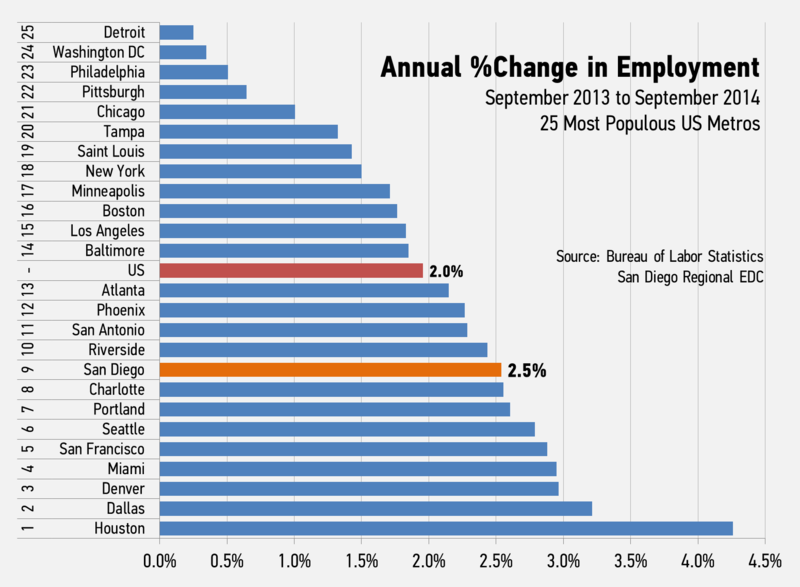 From September 2013 to September 2014, San Diego's unemployment rate fell by -1.4 percentage points, which ranked 8th among the 25 most populous U.S. metros. Since the end of the recession (June 2009), San Diego's unemployment rate has fallen by 4.1 percentage points, which is greater than the U.S. average. 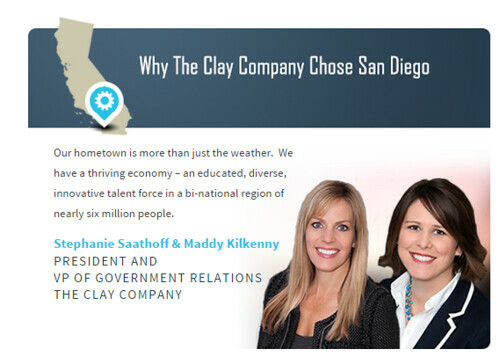 San Diego's employment grew by more than 2.5 percent from September 2013 to September 2014, which ranked 9th among the 25 most populous U.S. metros. 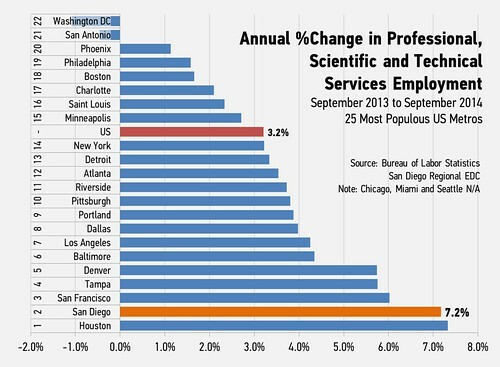 From September 2013 to September 2014, San Diego's employment in professional, scientific and technical services (PST) grew by 7.2 percent, the 2nd fastest growth among major U.S. metros. 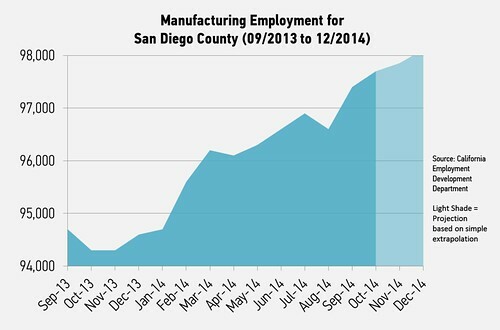 Manufacturing in San Diego grew more than 2.6 percent from the previous year, which is faster than both the overall employment growth and the U.S. manufacturing average. 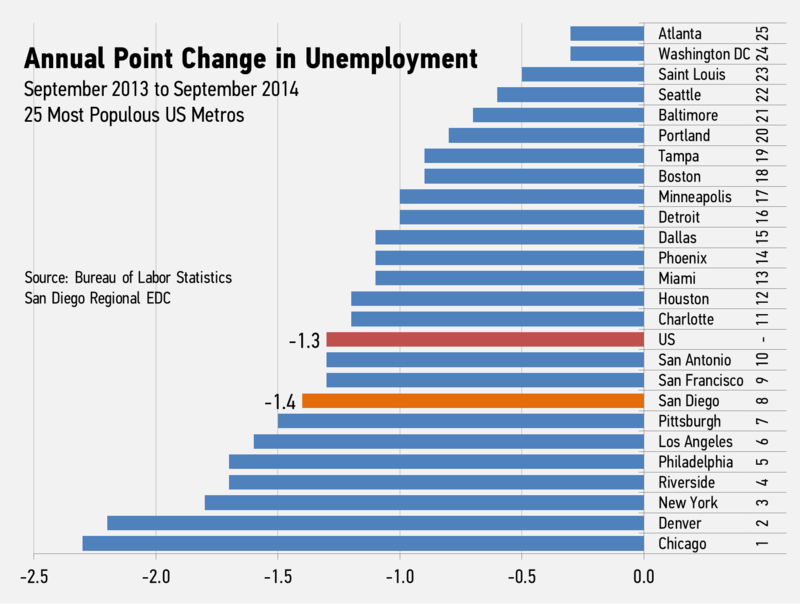 The Bureau of Labor Statistics (BLS) recently released employment data for the September 2014 period for all U.S. metro areas. At 5.9 percent, San Diego County’s unemployment rate fell by 1.4 points from this time last year. San Diego's rate ranked 16th among major U.S. metros and was slightly above the U.S. overall rate of 5.7 percent. 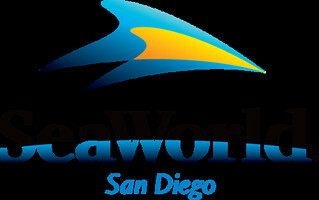 However, San Diego's rate fell faster than most. San Diego's percentage point change from September 2013 to September 2014 ranked 8th among major U.S. metros. While the unemployment rate in San Diego was higher than some of the region's key peer metros, it still fared better than other California metros like Los Angeles and Riverside, and fell roughly in the middle of the 25 most populous U.S. metros. 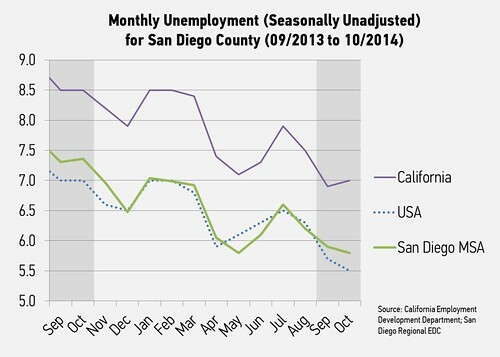 When looking at employment growth, San Diego fared better than most. From September 2013 to September 2014, the region's employment grew by more than 2.5 percent, which ranked 9th among the 25 most populous U.S. metros. The U.S. average growth rate was less than 2 percent, and only two U.S. metros, Houston and Dallas, grew by more than 3 percent. 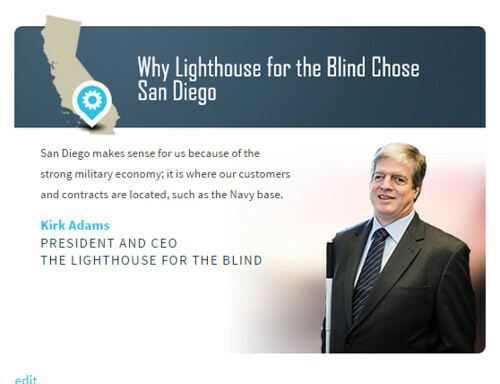 While San Diego's overall growth is very positive, we saw more explosive growth in one of the region's most important sectors. Professional, scientific and technical services (PST) is a sector of the economy very heavily associated with the region's innovation clusters. Much of the companies and employment in clusters like biotechnology, biomedical products, cleantech and information technology fall within the PST sector. From September 2013 to September 2014, employment in the region's PST sector grew by 7.2 percent, more than double the U.S. average of 3.2 percent. San Diego ranked second among the 25 most populous U.S. metros in this measure, which is a positive sign for the region's key traded clusters. 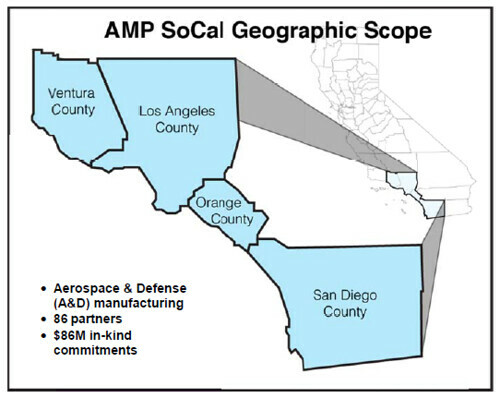 Manufacturing is another key industry for growth in the region, not only because manufacturing jobs are accessible and pay well, but also because certain manufacturing subsectors are critical to the region's innovation clusters. 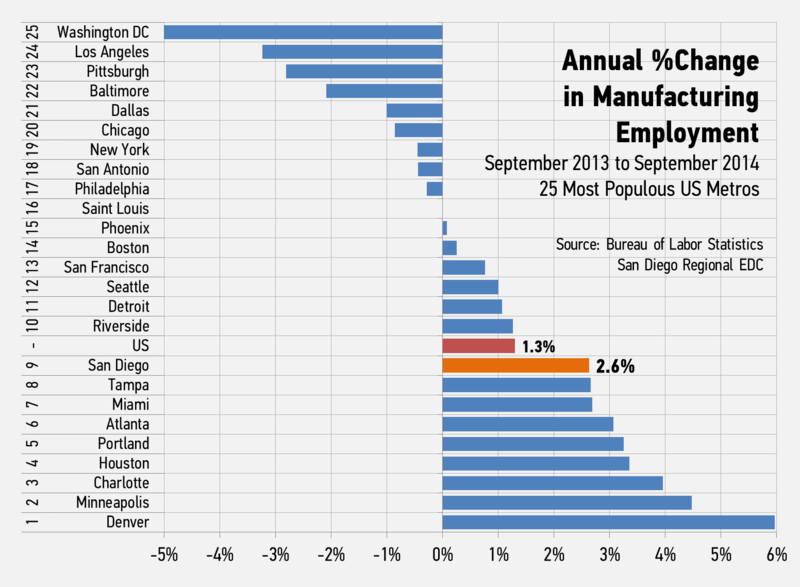 From September 2013 to September 2014, manufacturing employment grew by 2.6 percent, which was faster than the region's overall growth rate. San Diego's manufacturing employment grew at twice the rate of the U.S., and recorded the 9th highest growth rate among major U.S. metros. 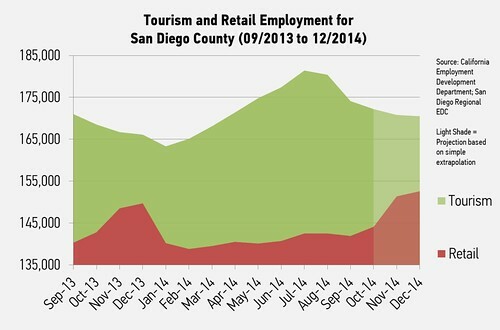 As we discussed in the Manpower Monthly Employment Report earlier this month, San Diego's economy is experiencing strong positive employment growth. 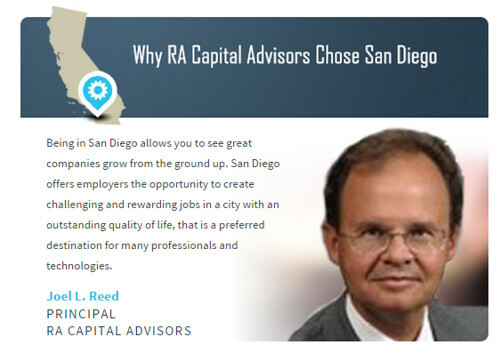 That point is even more apparent now that we can observe that growth in the context of San Diego's peers. 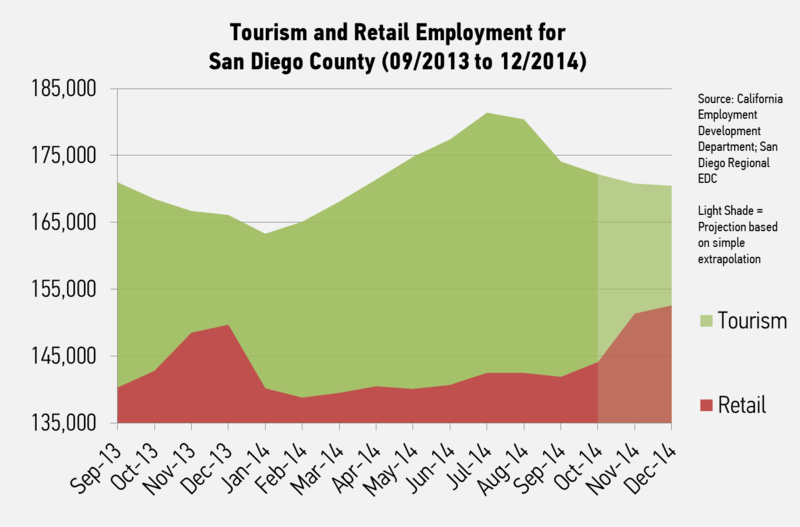 While the unemployment rate isn't as comparatively low as we would like to have seen, Summer-to-Fall seasonal effects are often felt more strongly in San Diego, given the region's large tourism industry. We've generally seen the unemployment rate track at or below the U.S. average, and don't expect that to change much in the near future.